The Peasants' Revolt of 1381, in which the men of Chipping Barnet played a leading role, captured for us by the horrified St Albans chronicler. 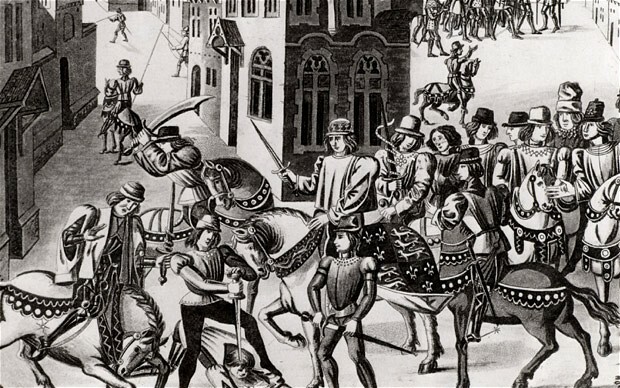 During the following week the rebels attacked the symbols of the abbot's lordship, broke into his prison, woods and warrens, burnt the hated court rolls and, in a startling piece of theatre, staged a mock mass, placing torn-up documents instead of bread on the tongues of the (un)faithful. They also forced the abbot to issue charters for each village: 'The people of Barnet came with bows and arrows, two-edged axes, small axes, swords and cudgels and obtained a similar charter of liberties as those of the people of St Albans, including free hunting rights, fishing rights, and rights of erecting hand mills' (milling was the lord's monopoly). After this they demanded' a certain book made from the court rolls' so they could burn it because it contained evidence that' almost all the houses of Barnet were held by the rolls'. The abbot prevaricated' promising it within three weeks, and thus saved the book for posterity. The revolt was over in London on 20 June, although total suppression took longer. On 28 June royal commissioners arrived in St Albans, but there was still some resistance: '300 bowmen from the surrounding villages, especially from Barnet and Berkhamsted'. Nevertheless the rebels knew they were beaten. On 15 July Richard II arrived in St Albans and annulled all the abbot's enforced concessions, and on 20 July received oaths of fealty from all the inhabitants of Hertfordshire. Many of those involved in 1381 were not peasants at all, but men of substantial property. The Barnet rebels in 1417 included twelve freemen, among them a citizen of London. The general solution which gradually emerged during the 15th century was the disappearance of personal unfreedom.and its associated services and indignities - and refusal of such services had long been another constant in the Barnet rolls. Once personal status was no longer an issue, the actual copyhold tenure, that is land held by copy of court roll, ceased to be resented, and lasted until the 20th century.